The purpose of this bulletin was to promote reading. The setting was designed to illustrate an inviting environment for reading during the winter season. 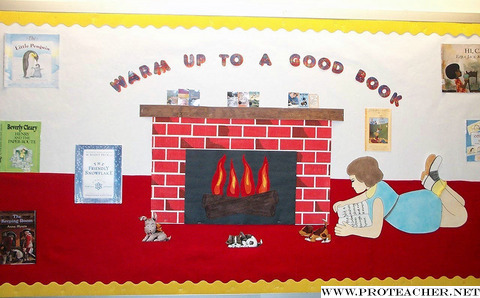 'Warm Up To A Good Book' provided students with an attractive option for a pleasant activity during the cold winter months. Displaying book jackets that appealed to varied interests and reading levels further promoted the concept to the wide range of students visiting our library media center. Multi-dimensional elements were incorporated in the design to enhance visual stimulation. The young girl reading had lace on her anklet socks, the carpet was felt, and the fireplace was made of corrugated material.